This year we will “build” a lovely garden. I will supply the site in the newsletter and on our website. A picture will be supplied on the website, and I will have my sample at each guild meeting. 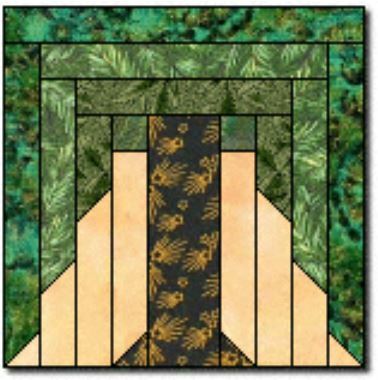 At our first meeting, I will offer a layout for a 72” square quilt. To make it a 12” block, I am adding a fifth green and a ground strip cut at 1-1/2.” There is no paper-piecing involved in those strips. After the January meeting our BOM “club” will meet at 6:10 or 6:15—after demo and before the meeting. Unfortunately we were not able to spend time starting the construction of our garden. You will still get the same introduction to paper-piecing and a short talk about the Weeping Willow block at 5:45 during the demo time at this month’s guild meeting. This month we will move on to the center “patio” of our garden and a lovely picket fence to surround your garden (the outer border). 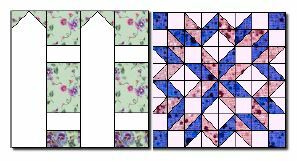 The picket fence block will contain your focus fabric. These are introduced to you early so you have all year to make a lot of picket fence blocks and take your time on the patio. More to be revealed at our February 6:15 BOM meeting.